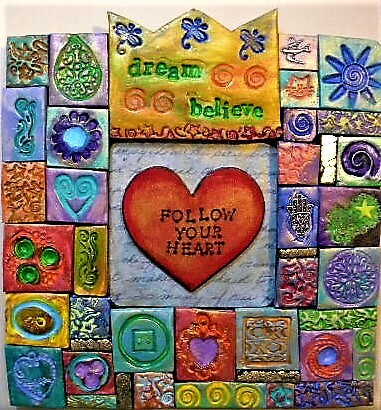 Polymer clay mosaic art is one of the crafts I never get tired of making. 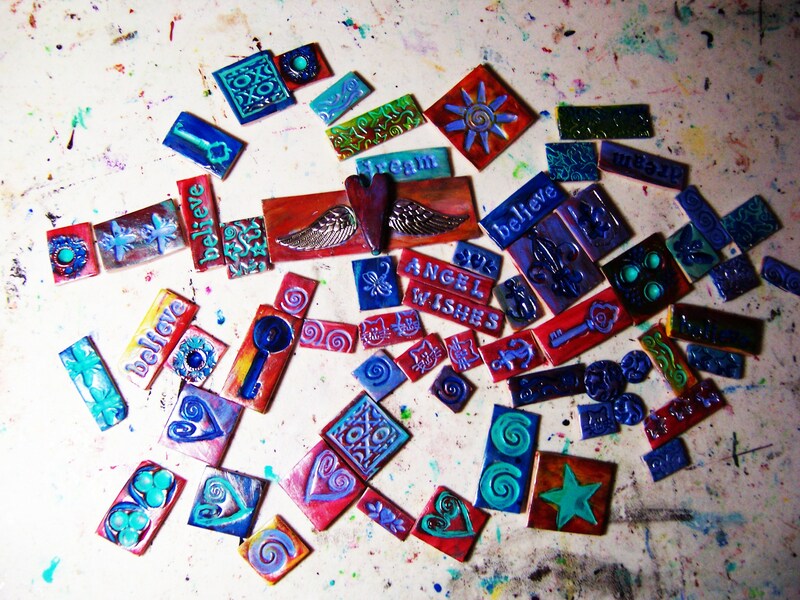 Polymer clay is incredibly versatile as it can be used in jewelry and sculpture, but I mostly stick with the mosaic tiles. 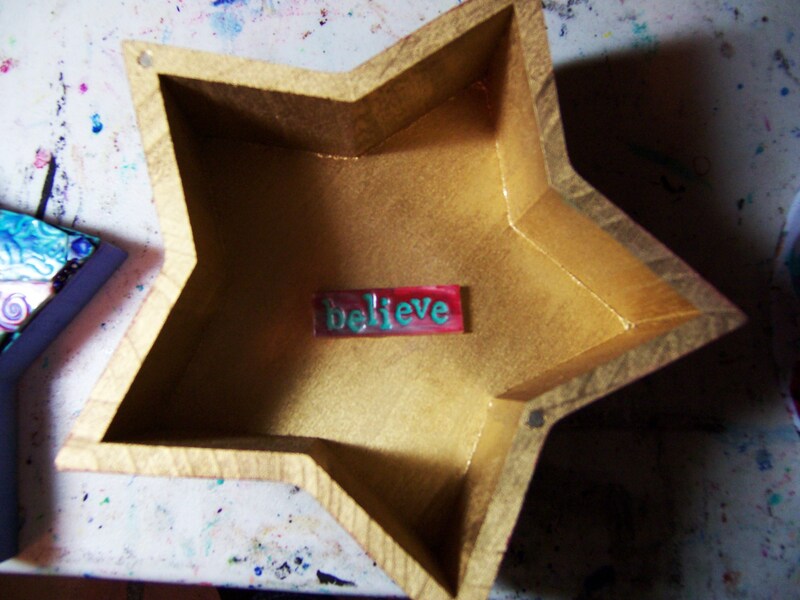 I have made these kinds of boxes and frames for years and they evolve as I come up with new ideas. 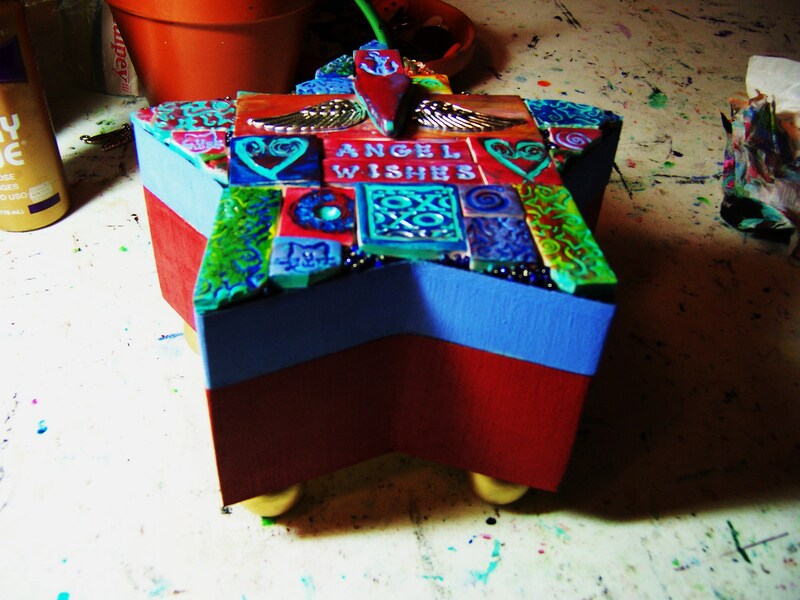 At one point I incorporated recycled Christmas heart ornaments into the art. 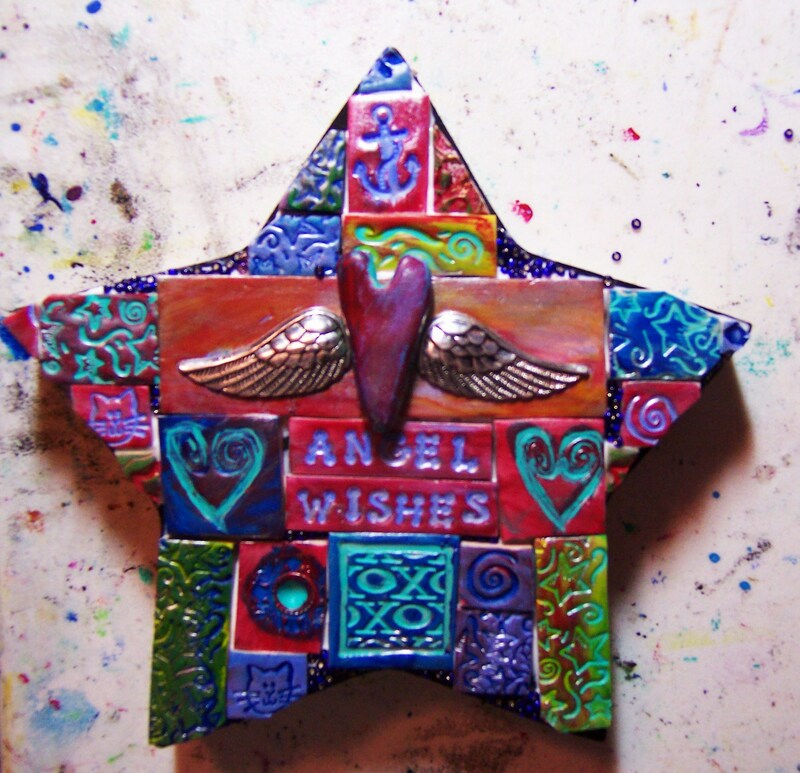 Lots of mixed media in this old piece and the altered heart ornament is in the middle. 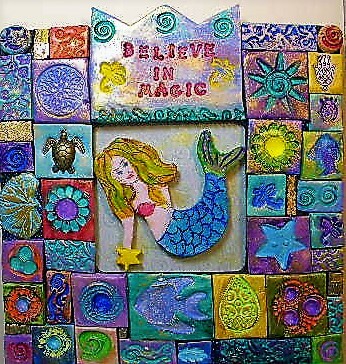 I also used to embellish paintings with mosaic tiles in the past. The veil is actual lace that I stiffened with Mod Podge. The face is made with a polymer clay mold and the dress is covered with tiles. This older box has a dragonfly charm attached to it. My most popular how-to video on YouTube is about painting mosaic tiles. You can check it out here. It’s not hard to make tiles. It takes time and you have to be willing to follow through with the process to get the tiles you like. 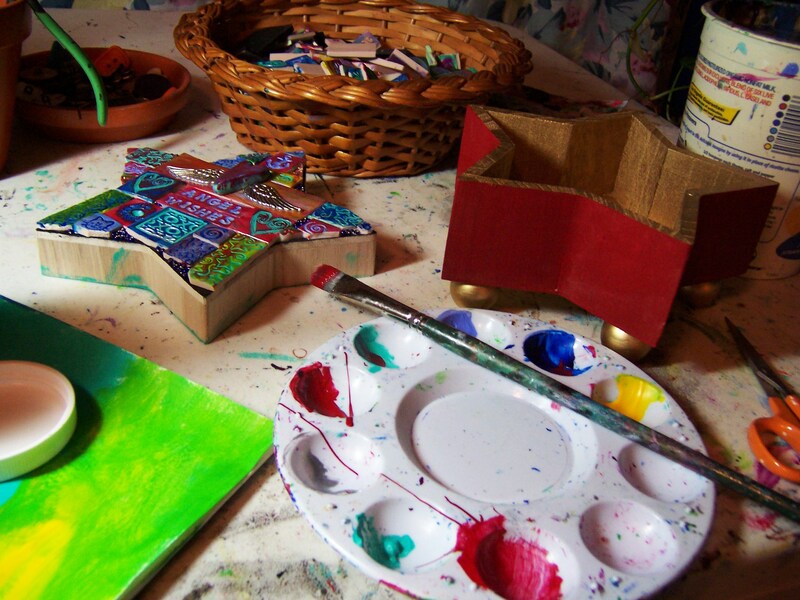 Then the fun begins–designing your boxes or frames. Have a wonderful, creative week. P.S. To get my monthly newsletter, you can sign up HERE. I’m grateful that I enjoy making stuff with my hands. 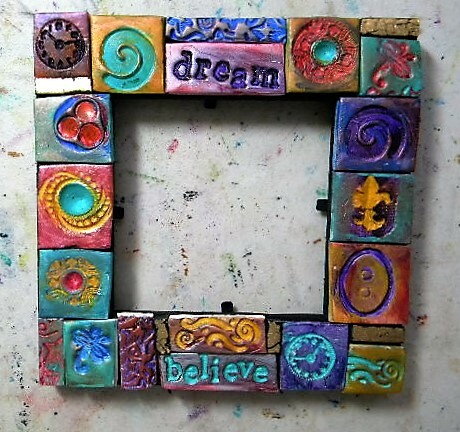 As a kid I learned to sew, knit, and crochet, but these days I mostly create polymer clay embellished boxes and inspirational frames. I love the meditative quality of crafts. I don’t have to think too much, just make the tiles and paint them. They usually come together easily once I design the box lid or frame. I also make handmade art journals, which are SO MUCH FUN! I can get real sloppy with inks and paints. 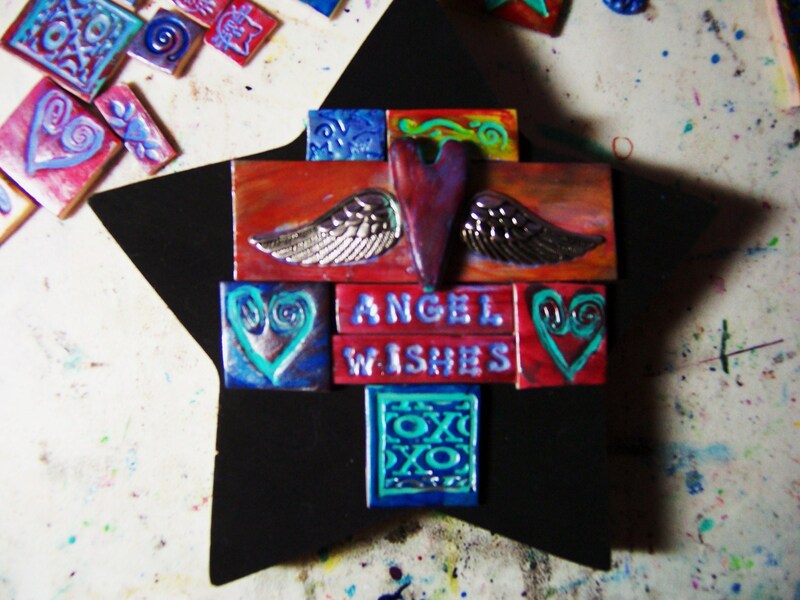 I sell the crafts on etsy in my EARTH AND FAERY shop and they are quite popular. That is a side bonus that also inspires me to make more. If you live in the boonies you are surrounded by nature, but if you live in an urban area like I do, it’s hard to get outside and be surrounded by trees. I live by a park, and that was a choice I made. Pretty much every day I go to the park, and the energy fills me up. There is something so healing about nature, and it also balances you. Just as you make a commitment to join a gym, you can make a commitment to spend time in nature every week. Look at it as self-care. There are so many tutorials on YouTube you could spend a lifetime getting inspired by other people’s art. Half an hour here and there works wonders. I also love to look at art by the old masters. A trip to an art museum or gallery can be inspiring. Every month I get together with a couple of artsy friends and we have an art party. We take turns to host it. We make art, talk, and eat a great lunch. It’s truly refreshing and inspiring. I usually end up working in my art journal. Doodling is one way of expressing art while deep into a discussion. If none of these things appeal to you, well, come up with your own regimen for creative self-care. Then the well will always be filled. 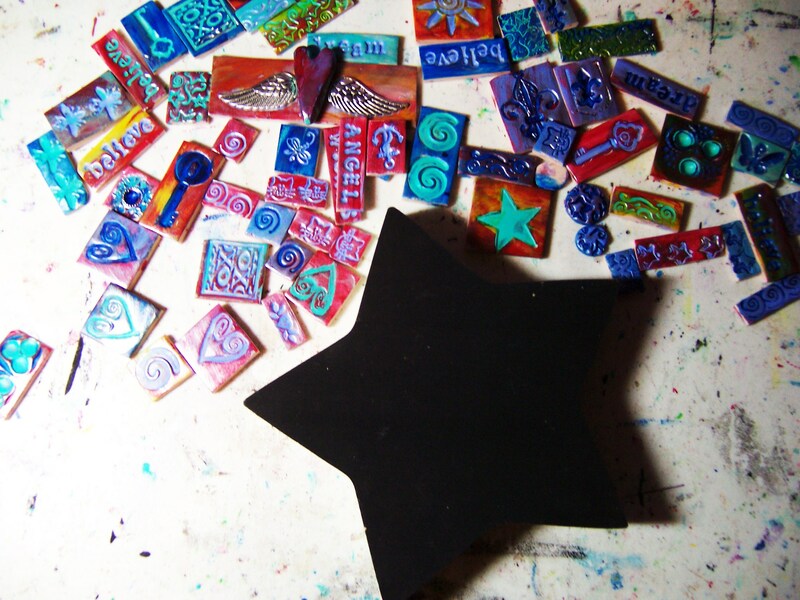 I thought I would be bored in the long run making polymer clay mosaics. 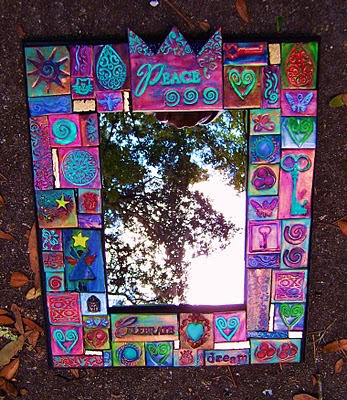 Ever since I came across Laurie Mika’s book Mixed Media Mosaics I have been hooked. That was years ago and I still make them. Check out that cute elephant. 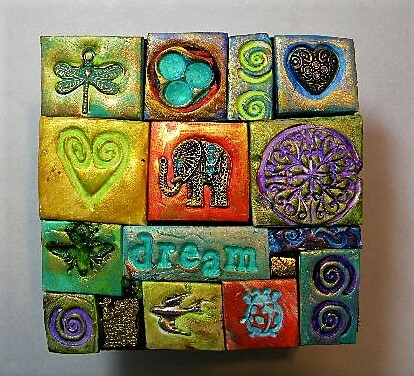 I pretty much use dragonfly charms for the center tile, but I’ve had this special charm for a while. I used to do stained glass mosaics on tables and such, but that is very fiddly and I wasn’t really into beautifying furniture for life. My main gig is painting, but I have a strong streak of “craftiness” and I find it soothing to plug away at crafty things, namely mosaics. Though I also make some handmade journals for those who don’t know how to start art journaling. Starting with a painted page is easier. To go back to mosaics, my You Tube video on how to paint polymer clay tiles have gotten more views by far than any of my other videos. Lots of people into polymer clay these days, and that’s great! If you haven’t seen the video, here is the link. It’s really not that hard once you get the hang of it. The variations are endless. I like to add some inspiring words to the art. People should be reminded to follow their dreams. Otherwise, life is pretty much wasted in my opinion. We all need something inspiring in this day and age…. 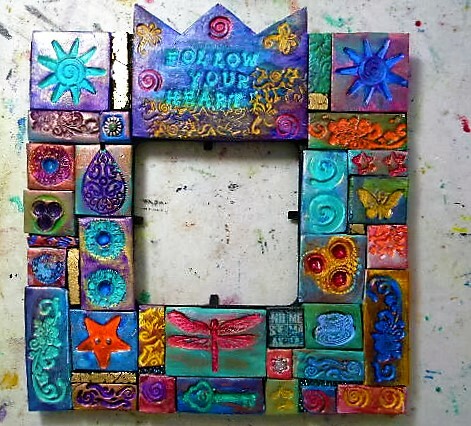 If you’d like to find out more about making polymer clay mosaics like these, I have an e-course where you would make a box (similar to the one above) from beginning to finish. I show you every step of the progress. The course is ONLY $23! Check it out. Back to painting now! Wishing you a creative and happy weekend. P.S. You can check out the journals and other things in my etsy shop Earth and Faery.